Carleton Sentinel Friday, April 29, 1904. The April term of the circuit court met in the Court House on Tuesday morning at 11 o'clock, His Honor Chief Justice Tack presiding. The large number present from all parts of the county testified to the great interest being taken in the only criminal case on the docket, that of the King vs George Gee, charged with the murder of his cousin, Millie Gee. When the grand jurors roll was called each of the twenty four responded and retired to the juror's room, where John R Thompkins was chosen foreman. Upon their return, the Judge made a short address touching upon the enormity of the crime before them, and also spoke of the inconvience of having the jail in town and the court house two miles away. He strongly urged the erection of a new court house along-side the jail. The grand jurors were not long in bringing in a true bill in the murder case, and also a recommendation in regard to the location of the court house, which is here given. The following resolution was passed by this grand jury of the County of Carleton , concur with the remarks of His honor the chief justice with reference to the inconvience arising from the Court house being so far removed from the jail, and would recommend the building of a new Court House in the Town of Woodstock on the county lot. Moved by J W. Hay and seconded by Jas. E. Drysdale. At two o'clock the prisoner was put in the dock, the customary plea of "not guilty" was made, and the real struggle began. Attorney General Pugsley appeared for the Crown, while J Chipman Hartley and T C L Ketchum were present to defend the prisoner. The work of selecting a jury proved more easy than was anticipated. The following were duly sworn:- Frederick Britton, F. Byron Bull, William Kimball, William Tompkins, Albert Simonson, Thomas Forest, George McLeod, Wilmot Carson, John J Rogers, James P Watson, J R Kirkpatrich and John M. Hay. Messrs W S Speer, Albert Bell, Benjamin McIsaac, George Britton, Joseph Merrithrew and Grover Flemming were stood aside by the defence, and thus escaped service. The address of the Hon Attorney General in opening was a model one. In a few words he outlined the case for the prosecution, going over the various stages in a clear and concise manner, and called as first witness Bennie Gee, in whose residence the tragedy occurred. Bennie Gee said that deceased had been hired by him and was working at his house. Geo Gee called at witness' house on Saturday night, March 12th, with two bottles of whiskey and a rifle. Witness had ordered a case of whiskey which had not arrived. After playing cards and drinking with george Gee, Dan Crane and Millie Gee, witness went to bed when he was aroused by hearing George saying he would shoot himself. Witness took the gun away from the prisoner. The prisoner seemed to be quite sober, although all the whiskey had been drunk. After a while Millie Gee gave prisoner the gun. About five minutes afterwards witness heard report of gun and saw deceased fall in the door. Deceased said prisoner intended shooting witness. Witness did not know that George Gee had anything agin' him in the world. At daylight witness saw prisoner with Peter Gee; prisoner wanted to speak with witness, but witness refused as prisoner still had the gun in his possession. Witness said that two weeks before the crime prisoner told him that he thought more of Millie Gee than any girl living and would show her for the next dirty trick played on him (prisoner). No doctors were present when Millie Gee died. Bullet came through the casing of the door through the body and through the floor. Cross guestioned by Mr. Hartley, Bennie Gee said that his wife had left him. When the witness started to take gun from prisoner, Dan Crane interfered saying his (Crane's) wife was scared. There were no intentions of a row. When Dr. Cummius arrived he administered morphine to Millie Gee. During operation witness was at Peter Gee's. Bullet passed through casing of the door, 31/2 feet from floor. Witness thought Millie Gee was 5ft 9in. in height, and in good health. When Deputy Sheriff Foster arrived with prisoner, Winslow, Dyer, Sally Demerchant, Martha dermerchant and Mary Gee were at witness witness house. Witness admitted that when he took gun from prisoner he(witness) threatened to tie the prisoner if he did not keep quiet. Witness admitted to the Attorney General that prisoner, George Gee, could drink considerable liquor before, going under the influence. Millie Gee told witness that George Gee had shot her. Capt. Weldon W Melville of Bath, sworn, said George Gee asked for a rifle on Saturday, March 12. Mr. Melville indentified bullets taken from magazine of rifle by Deputy Sheriff Foster as some of the bullets he had loaned. Witness said rifle would fire a distance of 2800 yards. Cross questioned by Mr. Hartley, said he had often loaned prisoner the rifle, and prisoner always mentioned why he wanted it. Prisoner did not seem to be drinking when he asked for rifle. Witness thought prisoner had very little education and signed his name with a mark. Witness admitted to Mr. Pugsley that George Gee appeared to be bright and intelligent. Peter Gee was next called. Very affably he answered the questions of the attorney general. On Sunday morning, March 13, prisoner George Gee called at witness' house with rifle. Witness could not identify rifle. Prisoner said he shot Millie Gee and that he was "d---sorry I had not shot Dan and Ben." Witness went with prisoner to Bennie Gee's but prisoner would not go in the house but wanted to hear how deceased was. Deceased asked witness to telephone for doctor and deputy sheriff Foster. Prisoner said he had telephoned. Prisoner wanted to see Bennie Gee and asked and asked him to "stick his d----, cowardly head out a little futher." Prisoner still had a rifle with him and appeared to be sober' and did not stagger. Willie Gee, sworn, said he saw the prisoner on morning of 13th March. Prisoner admitted that he had shot deceased and expressed himself as sorry that the bullet had not gone through her heart and that he had done what he said he would, that is he would shoot deceased. Witness refused to go with prisoner to see how deceased was. Prisoner seemed to be quite sober and to know what he was doing. Prisoner said he would not harm anyone who did not interfere with him. Hanfred Gee was next called. Witness said he was a brother of deceased. Saw prisoner on morning of 13th March, who admitted he had shot deceased. Prisoner expressed no sorrow at having shot her. The witness when cross questioned by Mr. Hartley, said that when the prisoner admitted he had shot Millie Gee he, witness, did not believe him. George W Tinker of Holmesville, was then called. He (Tinker) said that George Gee called on Sunday morning, March 18th, to telephone for a doctor and Deputy Sheriff Foster. Witness did so. Prisoner said he had shot Millie Gee and asked for some chewing tobacco. He appeared perfectly sober, and expressed no regret at having done the deed. Cross questioned, Mr. Tinker could throw no further light on the matter. Martha Demerchant, sworn, said she was a sister of deceased, Millie Gee, and that she saw George Gee on the morning of March 13th. Prisoner carried rifle; said he expected to go away as he had shot Millie Gee. Prisoner expressed his reason of shooting that Millie refused to go away with him. He said he would have shot all in Bennie Gee's house but for Bennie Gee's two little children. Witness was aware of George Gee and Millie Gee keeping company, and had heard Millie express a dislike for the prisoner. The prisoner appeared perfectly cool and said he wished he shot her dead. Sally Kinney was the next witness. George Gee called at Charlie Demerchant's on Saturday night at 8 o'clock with rifle. Prisoner departed leaving gun. Witness thought he came back afterwards to get the gun but I did not see him. I heard him say, "hand me my rifle, it stands by the table". Witness heard prisoner say that if Millie Gee would not go with him she would go with no one else as he would shoot her. When cross questioned by Mr. Hartley Sally Kinney had some difficult questions to answer and did not seem to feel altogether at ease. Mary Gee, a sister of the deceased, was next called. She said she heard George Gee say that he had shot Milie Gee, and meant the bullet for her d--- heart. The prisoner while saying this appeared perfectly sober. Edward E. Carney was the first witness called on Wednesday morning. He heard the prisoner admit the shooting. The prisoner expressed no sorrow at having shot Millie Gee. Cross questioned, Mr. Carney admitted that George Gee looked wild. He thought the prisoner was out of his mind. Insanity ran in the Gee family. (Here the prisoner had to be taken from the court room for fresh air.) When prisoner said he intended the bullet for Millie Gee's heart or head, witness said the prisoner seemed much excited. Deputy Sheriff Albion R. Foster testified he had arrested the prisoner several times. He had taken relatives of the prisoner to the asylum. When arrested for murder, the prisoner seemed to have been drinking some. Mr. Foster thought there was nothing wrong with the prisoner mentally. Mr. Foster, when arresting the prisoner, asked concerning the shooting. The prisoner said " it was bad enough." His Honor asked if the prisoner spoke to the deceased girl when taken to her by Mr. Foster. Witness replied that he did not. Mr. Hartley, objected to the dying declaration signed by Millie Gee, incriminating the prisoner. The prisoner seemed to be sane since the shooting. Cross questioned by Mr. Hartley, Mr Foster thought George Gee was perfectly sober. Mr. Hartley objected to calling Mr. Farley, J.P., who took the dying declaration of Millie Gee. Charles Demerchant, of Bath, said he saw George Gee on the evening of 12th of March. The prisoner had a gun. Cross examined by Mr. Hartley, witness said he and George Gee were going shooting deer. Sandy Dermerchant, sworn, said he saw the prisoner on the morning of March 13th between 6 and 7 o'clock. The prisoner expressed satisfaction in having shot Millie Gee. Daniel Crane of Canaan said he was living with Bennie Gee on the night of the murder. Prisoner called about 11 o'clock with a rifle. He sais he intended to shoot himself, and told Bennie Gee the same. Witness thought the reason of his suicidal intentions was that prisoner said he " had been fooled." Shorty after the prisoner said he had to go home, as his (prisoner's) father was sick. He asked to speak with Millie Gee. Both went outside. Witness thought he heard the report of a rifle, and saw Millie Gee fall in the door. Mrs. Crane got up and closed the door. Bennie Gee started to go outside, but was stopped by Millie Gee, who said prisoner would shoot Bennie Gee. Deceased said George Gee had shot her. The prisoner seemed very jovial before the shooting; talked sensibly and appeared to be sober. Millie Gee died on the Wednesday morning following. Cross questioned, the witness said the prisoner appeared to be restless at nights when working in the woods. On the night of the murder the prisoner seemed to feel the effect of the liquor. In answer to a questioned from his Honor, witness said prisoner had been keeping company with deceased for about four years. Dr. Frank M Brown, who conducted the operation on deceased, was next called. He described the passage of the bullet. He thought the wound was caused by a bullet such as shown in court. Witness thought on examining the girl that the intestines had probably been perforated by the bullet. He and the other doctors thought that an operation was advisable to save life of deceased. With the consent of deceased, witness, Drs. Commins and Ross began the operation, making an incision in the front of the body of about five inches. No perforations of the intestines was found and then the incision was sewed up. Deceased recovered before the doctors departed. and appeared to be comfortable. The bullet did not touch the spine. Witness gave a satisfactory explanation as to why the bullet did not perforate the intestines. It appeared that internal muscle moved the intestines to the front of the body in the deceased's excitement, thus removing the intestines from the passage of the bullet. Witness visited deceased again on Tuesday morning which was two days later following the shooting. Witness gave deceased every possible attention. At request of coroner, Dr Commins, witness performed post-mortem examination when girl had died. Thought death was caused by septic-peritonitis or passage of bullet through the abdominal cavity, and that without the operation the girl would have died. Dr. Brown was allowed a recess and Mrs. Crane followed. Catherine Crane, sworn, said she knew prisoner, for he was in habit of going to witness' house. Was at home ( at Bennie Gee's) on the night of 12th March. Prisoner arrive with a gun. Heard report of a rifle and saw Millie Gee fall in the door. Witness drank none of the liquor. Crossed questioned, Mrs. Crane said that after drinking the liquor all were perfectly sober. In explanation witness thought one was drunk when he was " laid out." The Court House was packed to its utmost capacity when Doctor Frank M Brown, who had been on the witness stand in the morning, was first called in the afternoon. The session began with Mr. Hartley cross examining. Witness admitted that there was no injury to the spinal cord and that no interior organ was injured. An operation is considered to be quite serious as-regards producing death. Witness has known cases where persons have recovered when shot through the abdominal cavity. 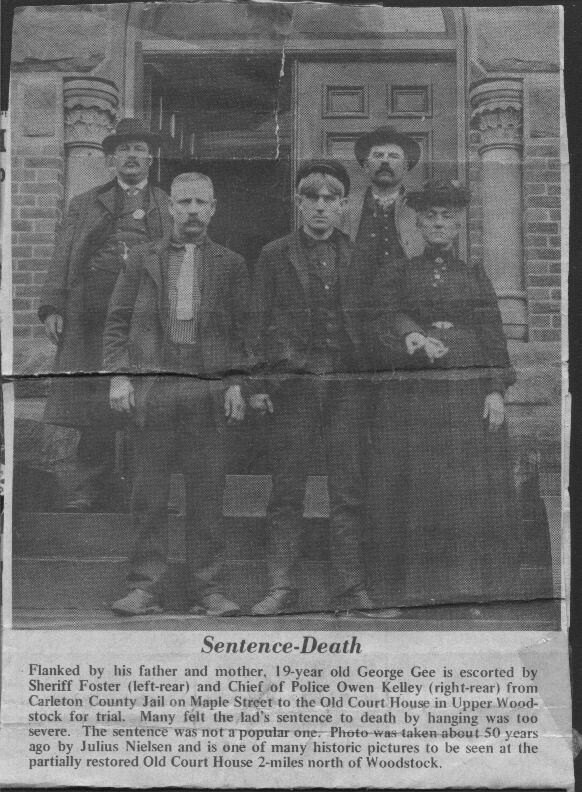 (Here the parents of the prisoner entered, Mrs. Gee casting a somewhat longing glance at her son George: the prisoner apparently did not see her as he was sitting with downcast head.) Dr. Brown said that the house of Bennie Gee was not a suitable place for operations such as he, witness, performed, and that he was at considerable disadvantage. (The prisoner, on account of the heat of the room, asked to go out for the third time in a day.) A questioned of surgery arose, in which Mr. Brown, the witness, the Attorney General and Mr. Hartley were vociferously interested. The outcome was that Mr. Hartley asked Dr. Brown " would you have operated had you known as much before as you know now ? " Witness said he would. Dr. M. Cummius was next called, On Sunday morning, March 13th, witness along with Winslow Dyer went to scene of tragedy. Millie Gee told witness that George Gee shot her. Witness thought the bullets displayed in court were similar to that which in his (witness') opinion, caused the wound, also the holes in the casing of the door and the floor before entering the body of the deceased. Thought the bullet passed through the casing of the door before entering the body of deceased. Thought the deceased's intestines would surely be perforated and that the operation was performed for the purpose of sewing up these perforations if any were found. (Here Mr. Hartley objected to the dying declaration of Mille Gee.) Witness said that during the preparation of the instruments he was busy administering the anesthetic. He thought as far as he could see the operation was conducted properly and that the deceased girl withstood the operation extremely well. Witness assisted Doctor Brown in the post mortem examination . Thought that there were not sufficient signs as to the cause of death at the post mortem examination, but concluded that peritonitis caused death. Cross examined by Mr. Hartley he said it was essential for a doctor to have a test for diagnosis purposes as in this case, to assist in saving a life. He would have advised an operation, and thought the bullet from the Lee-Enfield rifle would have caused the wound and that death resulted from peritonitis. The injury could have been caused by the operation. The operation would have been considered as more serious with Millie Gee than under ordinary circumstances. Death would probably have resulted from the wound without the operation, but could not say positively. It would not be expected that one would live when a bullet had passed threw the abdominal cavity. Dr. Ross was next called. He arrived at the scene of the murder between 11 and 12 o'clock on Sunday morning, March 13th. He thought all proper precautions were taken for the preparation of the operation and operation was properly conducted. Death would ensue if the bowels were rupture. Cross questioned by Mr. Hartley Dr Ross said death was caused from the effect of the wound but that there were equal chances to life and death. Witness said thet he had read of cases where peritonitis have recovered when abdominal cavity had been punctured, but not where the bowels had been raptured. Mr. Hartley quoted from American Text Book of Sugery that in the Boer and Cuban wars persons had died when the abdomen had been entered and an operation performed. Witness said that if an operation had not been performed it would not be known whether the intestines had been punctured, and that the only thing to be done to save the girl's life was an operation. Mary Hall was the next witness. Prisoner called at her house at about 4 o'clock in the morning to telephone for Deputy Sheriff Foster and a Doctor. Prisoner had a rifle with him, and said that he had shot deceased and he was not trying to get out of it. Cross questioned by Mr. Ketchum, witness said prisoner did not seem under the influence of liquor. Winslow Dyer was next called. Witness heard of the shooting through Doctor Commins. Prisoner was in possession of Deputy Sheriff Foster when first seen by witness on the morning of March 12. Cross questioned by Mr. Ketchum, witness said prisoner looked dissipated. Frank Doherty, sworn, said he saw the prisoner at Bath on Saturday, March 12. Witness gave the prisoner and his (prisoner) father a ride from Bath towards home. The prisoner appeared to have been drinking. Cross questioned by Mr. Ketchum, witness said that he (prisoner) was "purty well along, " and that the prisoner was handling the rifle "kinder careless." Witness was not surprised to see prisoner with a gun. Mr. Pugsley then said that the case was through as regards the crown. On Thursday morning Mr. Ketchum addressed the jury saying that he would produce witnesses to prove that George Gee was irresponsible for the crime committed and that he has insanity in his veins. Benjamin Gee of Canaan, the father of the prisoner, was first called. Prisoner, examined by T C L Ketchum, said he was the only son. Witness cousin was insane, and died in the Insane Asylum. Witness' uncle, Levi Kinney, was also insane and was in the asylum. Witness thought prisoner acted queerly, and was restless and acted odd generally, particular the last year. Cross questioned by Mr. Pugsley. Witness said he did not think prisoner was restless because of pain. Zora Gee, the prisoner's mother, was next called by Mr. T C L Ketchum. (Witness cast her eyes towards the prisoner.) Witness' cousin Ezekiel Crane was insane and in the asylum, also her first cousin Joseph Demerchant. Witness' uncle, Frederick Demerchant was also insane. Prisoner acted strange and was restless at nights. Witness told prisoner he was crazy. Witness was married 24 years. John Demerchant, prisoner's uncle, sworn, said that he knew prisoner since he (prisoner) was born; prisoner acted very strange; prisoner would undress his feet for practically no reason whatever and mended moccasins with no hole in them. Prisoner appeared restless while living with witness. Saw prisoner Sunday, March 13, with Dep Sheriff Foster and spoke to him. Cross examined witness said that prisoner asked deceased to enter the house on one ocassion while prisoner mended moccasin. Prisoner would get up at night and go outdoors. Did not think prisoner had physical pain; prisoner would lie on floor alongside of bed and not get into bed. Amos Demerchant, examined by Mr. Hartley, was next witness. He had known prisoner for some time. Prisoner was a great hunter. He looked very wild and haunted, in the eyes, during past three months. Witness knew insanity ran in the Gee family to quite an extent. Cross questioned by attorney general, witness delivered nothing more of importance. Frank Sweeney, examined by Mr Ketchum, said he lived three miles from Bath. Witness said he saw prisoner on Saturday March 12th. ; prisoner countenance looked very strange and in other ways generally odd. Witness admitted to Mr. Ketchum that some of the prisoner's relatives were crazy and that insanity ran in the Gee family. In opening, the senior counsel for the defence impressed upon the jury the deep responsibility resting upon them. The prisoner and his family were poor and unable to raise sufficient funds to fight crown, which had the whole of the country's resources to depend on. The peculiar circumstances of the case must be considered. Millie Gee could not be restored to life by the death of the prisoner. A mistake on the part of the jury could never be righted. There was opportunity to bring in a verdict of manslaughter. Liquor was much in evidence. It must have been somewhat of a general celebration. Insanity runs in the Gee family. The young prisoner was brought up under disadvantages as regards education. His parents were cousins. This would tend toward insanity in their offspring. In the Boer War persons wounded in a similar manner to Millie Gee recovered without operation. Those operated upon died. The prisoner deserved the sympathy of the jury. One who was refined and educated ill deserved sympathy, but the prisoner was uncouth and uneducated, and was not fully responsible for any action. In closing, Mr. Hartley admonished the jury to do their duty between themselves and their God. The learned counsel's eloquent address, which lasted nearly an hour, so affected the prisoner that tears were in his eyes and he was forced to retire. Hon. Wm. Pugsley, for the Crown, began by referring to the unfortunate position of the prisoner. The jurors must not let sentiment influence their verdict. There was not a shadow of defence for George Gee. He had deliberately taken the life of his cousin. As to the claim of insanity, the learned counsel quoted the law showing burden of such proof to be upon the defence. Prisoner knew he had done wrong, and gave himself up willingly. Insanity can not be made out of conjecture. Prisoner had boasted of his intention to shoot deceased. Here the events leading up to the tragedy were outlined by counsel. It is plain that the murder was premeditated. Malice was apparent. The doctors operated in good faith, and in his (Pugsley's ) opinion deserved the highest praise, and were worthy of a larger field of practice. There was urgency for the operation. Deceased was in great pain. The attorney general closed by expressing his wish that there had been some point of sufficient force to save the prisoner. He made no appeal on behalf of the crown. He had done his duty in pointing out the facts of the case, and nothing more. His address lasted 40 minutes. Adjournment was taken for dinner. At 2 o'clock His Honor charged the jury, and they retired to consider the verdict. The judge's charge was, on the whole, against the prisoner. The jurors were out three quaters of an hour, and returned with a verdict of "guilty." They were then discharged, and the prisoner will be sentenced to death this morning at 10 o'clock. The prisoner received the verdict with a smile on his face, and remarked that it was all he could expect.